UMD researchers help explain why machine learning algorithms sometimes generate nonsensical answers. Research by Distinguished University Professor Emeritus of Computer Science Ben Shneiderman found factors that raise the average number of citations that a university research paper receives. Predicting which patients will benefit and which ones won’t has been an elusive but very important goal, because immunotherapies can have significant, even life-threatening side effects, and costs can run into the hundreds of thousands of dollars per treatment. University of Maryland computer scientist Mark (Max) Leiserson and colleagues from Microsoft Research and Memorial Sloan Kettering Cancer Center believe a solution lies in a new approach to the data, one that analyzes multiple facets of patients and their cancer simultaneously rather than seeking a handful of key factors that can predict success. In a study published in the journal PLOS One on December 31, 2018, Leiserson and his colleagues used data from a clinical trial of bladder cancer patients to demonstrate that their approach could identify a suite of features that accurately predicted a key immune system response to treatment while reducing over treatment by half. 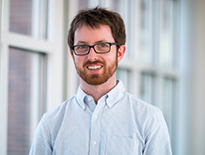 “If your goal is to treat everyone in that particular dataset who will respond, the type of multifactorial modeling we show in this paper will let you do that while treating many fewer people who won’t respond,” said Leiserson, the paper’s lead author and an assistant professor in the Department of Computer Science at UMD. Leiserson began conducting this study while he was a postdoctoral researcher at Microsoft Research, New England and continues to consult for the company. “What’s also exciting about this study is that we were not just looking at patient outcome, but at a specific marker of immune response, which gave us a much better picture of what’s going on," said Leiserson, who also has a joint appointment in the University of Maryland Institute for Advanced Computer Studies. Leiserson and his team analyzed data from a clinical trial of the drug atezolizumab on patients with advanced bladder cancer (metastatic urothelial cancers). Currently, the primary methods for predicting treatment success with this class of immunotherapy drugs (known as immune checkpoint therapy) rely on two key biomarkers—features of a patient’s disease that correspond to treatment outcomes. One biomarker is the number of genetic mutations in the tumor cells, the other is the presence of a protein called PD-L1 that prevents immune cells from attacking cancer cells. In this case, using those two biomarkers to identify patients for treatment casts an overly wide net. In order to reach 100 percent of the patients who will benefit, clinicians would treat 77 percent of the patients who did not benefit from treatment. Another unique aspect of the team’s approach is that they focused on predicting changes in T cells in patient blood rather than simply predicting overall patient outcome. “We looked at immune cells in the tumor and in the blood before and after treatment, and we asked the question, ‘Which of the immune cells that were in the tumor before treatment expanded in the blood after, potentially meaning they were responding to something?’” Leiserson said. Understanding that response provides a much finer grained picture of the interactions between tumor, therapy and immune system. “Progression-free survival is a standard measures of response to a cancer treatment,” Leiserson said. “But in our case, we have a more continuous value that is closer to a direct readout of how much of an effect the treatment has on the immune system. And, in this data set, the predicted immune response is strongly associated with durable clinical benefit.” Meaning, the cancer had not progressed in the six months after treatment. To learn more about Max Leiserson's work, watch the video "Designing Algorithms to Fight Cancer. The research paper “A multifactorial model of T cell expansion and durable clinical benefit in response to a PD-L1 inhibitor,” Mark D. M. Leiserson, Vasilis Syrgkanis, Amy Gilson, Miroslav Dudik, Sharon Gillett, Jennifer Chayes, Christian Borgs, Dean F. Bajorin, Jonathan E. Rosenberg, Samuel Funt, Alexandra Snyder, Lester Mackey was published in the journal PLOS One on December 31, 2018.